Coroplast signs are a great, inexpensive display solution for indoor or outdoor usage. Our coroplast signs are created by mounting an adhesive backed vinyl print onto coroplast to create a rigid vinyl sign. This produces a much higher quality print than those produced by a flat bed printer printing directly onto the Coroplast. Coroplast is a corrugated plastic mounting board that is light weight, durable, and weatherproof. It has vertical channels running through the sheet that allow wind and water water to pass through, and work perfectly with step stakes and yard sign holders. One thing to note is that these vertical channels do create vertical lines that are visible in the mounted print from close distances, but they are not very noticeable from a normal intended viewing distance. 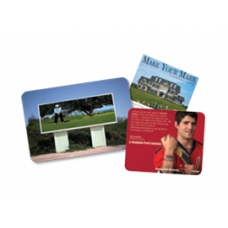 Coroplast signs are often used for real estate signs, promotional offers, golf signs, political signs, and outdoor directional signage applications. We offer several thicknesses of Coroplast to choose from, as well as different adhesive back vinyl print qualities, to accommodate a wide range of budgets, quality, and project requirements.